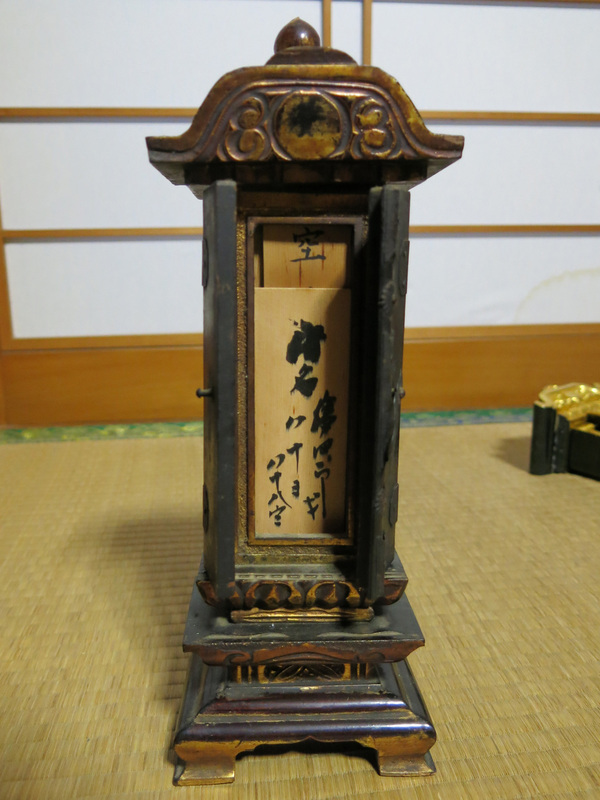 The butsudan is a small shrine, or Buddhist altar, that is common in many Japanese households. In rural areas most all houses have butsudan, while in cities, given space constraints, they are slightly less common. The butsudan is essentially a small cabinet, either self-standing or built into a wall, with multiple shelves that house Buddha statues and pictures, other religious items (butsugu) such as incense burners, resonant bowls, and candles, as well as shelves for pictures and Ihai to pray to and leave offerings for ancestors. Technically, the butsudan is a place to honor and make offerings to the deceased, whereas a separate shrine, called a kamidama, is used to pray to and make offerings to the gods. Functionally, however, in most households the butsudan and the kamidana merge, with the lower levels of the shrine being the butsudan/ancestor area, and higher levels being for the gods/kamidama. Notice in the above picture of the Kikuchi family butsudan, the colorful papers hanging from the top are from Shrines (kamidana). This distinction (or lack thereof), is a great example of the confusing and integral way that Buddhism and Shintoism coexist within Japanese culture. Ihai, or spirit tablet, are small pieces of wood that document the passing of family members, and are kept in the family shrine in the home. When a family member passes away, their name, death date, and sometimes age will be written on the wood. The ihai then is stored with the other deceased, and is prayed to/given offerings. 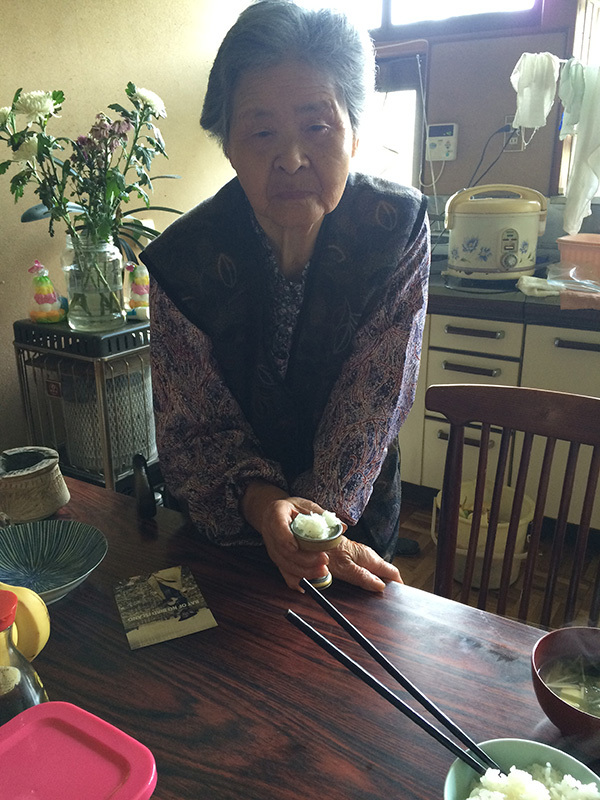 Every day at the Kurodasuke farmhouse, Takayo brings a small bowl of rice and a cup of tea as an offering. The Kikuchi family ihai proved to be very helpful in tracing back the generations living in the house. Many of the ihai have a name and a death date. Some have a birth date. Some don’t even have a name, just the date of death. Many of the old ehai are written in very old style kanji, so they are difficult to read. 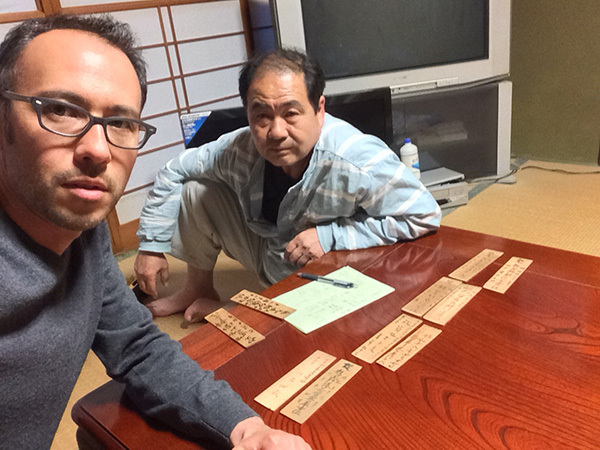 Migaku and I took out all the ihai and organized them as best we could by generation, tracing back six generations to the first known Kikuchi to live in the farmhouse, Hyoemon Kikuchi (1820 - 1894). Kikuchi family ihai organized by generation. See below for translation.